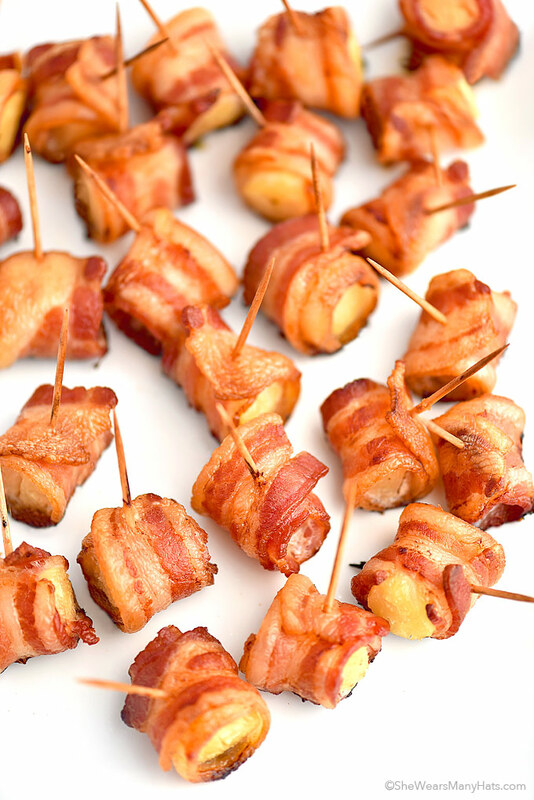 This Bacon Wrapped Pineapple Bites Recipe is an easy savory and sweet appetizer perfect for any party. Easy, yet delicious appetizers are essential when entertaining. 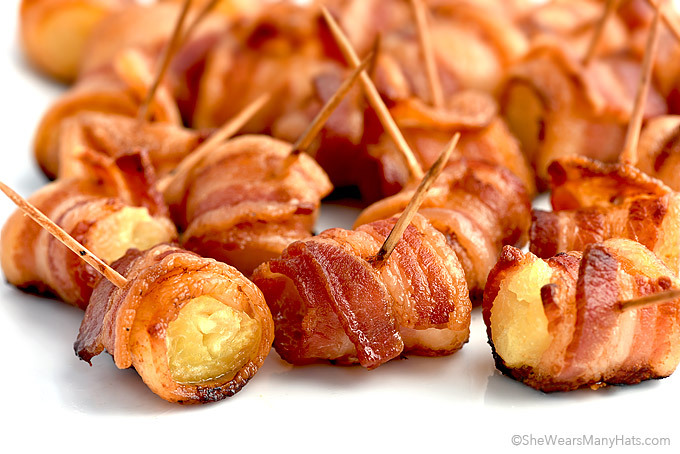 And it doesn’t get much easier or tastier than these Bacon Wrapped Pineapple Bites. Even better, they can be prepped ahead of time, chilled, then baked right before serving. This easy appetizer can be prepared ahead of time, then refrigerated until ready to bake. Please note, if considering cooking this on a grill, since bacon has a high fat content, the grill should be monitored closely for flare ups. Positioning the bacon wrapped pineapple not directly over the flame would be best. Just be careful to watch for flames as the bacon grease drops below. Otherwise you may end up with shriveled bits and pieces of bacon left clinging to the pineapple. We may or may not have learned this the hard way. It’s best to use fresh pineapple for these Bacon Wrapped Pineapple Bites. I’ve used canned pineapple chunks and while they are okay, fresh cut pineapple is so much better. Over the years I’ve enjoyed fresh pineapple that has tasted so delicious I’ve wondered if it has been injected with vanilla or something. So delicious! Have you ever cut up a fresh pineapple? If not, it’s easy and once you learn how to you’ll be enjoying fresh pineapple every chance you get. For easy instructions on how to carve a fresh pineapple I found this easy to follow video from Every Day with Rachel Ray magazine. 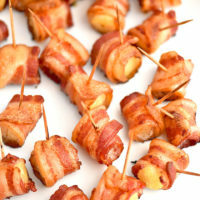 Super simple savory and sweet appetizer bites made with bacon and pineapple. Preheat oven to 400-degrees F. Line baking sheet with baking parchment or aluminum foil. Wrap each pineapple with piece of bacon, secure with toothpick and place on lined baking sheet. Bake until bacon is crispy, about 20-25 minutes. I can’t wait to make this! It looks soooo good. Yay! Something new to wrap bacon around! Love it. I baked it on parchment and baked until it was crispy. The bottom was actually crispier than the top and sides. Place on a rack to bake in oven so that all sides of bacon are browned and there are no raw spots. I love bacon-wrapped anything but have learned this is the way to bake something wrapped in bacon. Also the bites don’t sit in baco grease – it drains off whie baking. A perfect app for the holiday’s……….making this for Thanksgiving. Did you presoak the toothpicks in water so they don’t burn? Yes, I soak them for at least 30 minutes. That sounds like something good to try! Actually if you roll the entire piece in brown sugar the bacon is carmelized with the sugar and the whole thing is just heaven. I agree that fresh pineapple is the winner here. I love this sooo much! I use canned pineapple chunks and roll them in brown sugar. Then wrap in 1/2 slice of bacon and wipe the brown sugar off my hands onto the bacon! Usually in my oven for about 35 min at 400 deg. Any one try using pineapple slices and cooked them in a skillet? I fry the bacon half way done then rap the pineapple then bake at 350 for 15 min. Had a little trouble baking these-smoked up the house because of the grease from the bacon. Parchment was floating in grease! Ended up baking for 25 minutes, removing from the oven, changed parchment & baked another 15 minutes to get the bacon crispy. You also need to use pans with sides as grease ran all over from cookie sheet. They taste very good & will know what to do next time!